"I've done everything right and it doesn't work" usually means you haven't done everything right. Pins marked "+" are LIPO voltage. 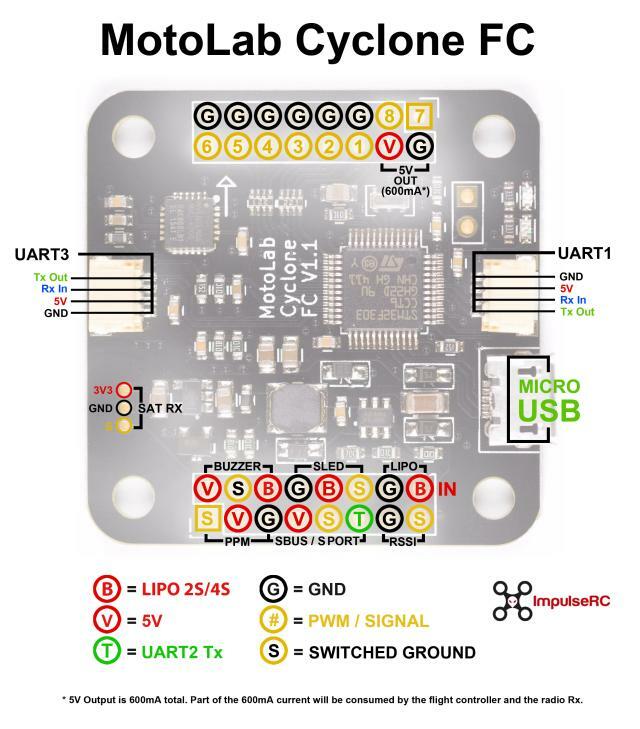 LIPO input voltage is limited to 6S, depending on the regulator used. Pololu recommends an external 33uF 50V capacitor for over 20V inputs. The LIPO IN pins are connected internally to the VBAT monitor. All of the numbered pins are PWM outputs. The LIPO "+" and BEC "V" pins on the Tornado have reverse-current blocking diodes to prevent powering ESCs from USB power. On Cyclone, only the LIPO "+" pin has the diode. None of the "V" pins should have an external voltage applied on the Cyclone. Pins marked "V" are +5V ONLY. Do not connect anything over 5V to these pins. To bypass the BEC "V" input diode on Tornado and output 5V on this pin, short the two-pad jumper below the PWM 1 input. The Pololu switching regulator may be mounted on top or bottom of the board. Observe the orientation. 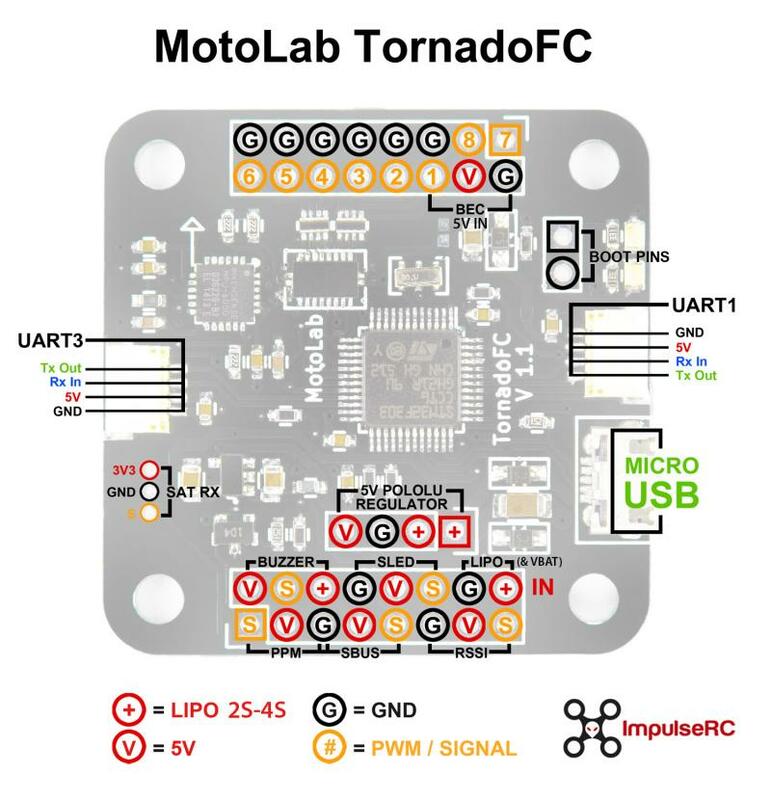 If using an external 5V BEC of any kind on Tornado (including a Pololu not mounted on the board), connect it to the pins labelled "BEC 5V IN". SAT RX and SBUS use UART 2. The X4R ground, 5V and rx signal pins should be connected to the SBUS "G", "V", and "S" pins. Be sure to read post #3 on the Warpquad thread. This is meant to supplement that information. The MultiWii_MotoWii_RevB_V3 contains a folder called "MultiWii_MotoWii_RevB_V3". To open the sketch in arduino, browse into that folder and select the file "MultiWii_MotoWii_RevB_V3.ino". Make sure you're in the right place. For Spektrum-compatible satellites, the radios may bind at either 1024 or 2048 resolution. The sketch is set for 2048, but if your receiver channels seem scrambled you may need to change #define SPEKTRUM 2048 to #define SPEKTRUM 1024. To switch from Spektrum satellite to a PPM_SUM receiver, comment the #define SPEKTRUM line and uncomment one of the #define SERIAL_SUM_PPM lines that corresponds with the channel order in your transmitter. To enable 125uS onshot mode on the KISS ESCs, uncomment #define ONESHOT. You'll need to short the J1 jumpers on the ESCs too for this.